But what’s really innovative is how we’re asked to navigate this content. The popup window is turned into what amounts to a traditional web page (albeit using tables, as CSS is not available) with a column of links that upload further KML. This allows you to avoid the unwieldy Layers pane, in most cases. All this turns the Gombe Chimp Blog into an instant favorite for science outreach. 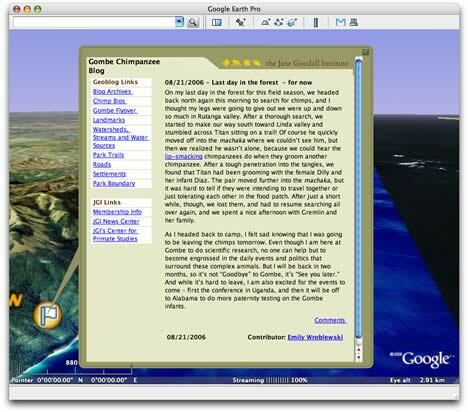 It also pushes Google Earth’s HTML rendering to the limit — it sure would be nice to be able to generate W3C-compliant rendering of CSS and XHTML inside Google Earth popups in the future. I, for one, would also like to see video depicted inside popups. It’s a natural thing to expect, from a user-interface perspective. Kudos to Bryce Tugwell, BTW, for concocting all this. He adds that there is more enhanced data on the way. Hopefully, we’ll soon also get a network link we can subscribe to. I’m about to do a kml-set for my roadocumentary ‘Berlin Jerusalem – A Limescapade’ that follows the route of our car trip downthere …. I woul love to integrate episodes of the movie into the landmark-popup windows ….